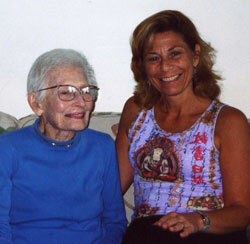 Yoga for Seniors - Amazing Yogini 103 yrs "young"
This is one of my cherished yoga pictures. Read about a dear friend and devoted student Reta, a supreme yogini from my Yoga for Seniors classes. Here's Muriel again in this inspiring seated yoga asana. See her arms behind her back in the 'Namaste' Mudra? Incredible, huh? She has her hands together effortlessly. She is sitting crossed legged in Sukhasana, a yoga asana usually known as Easy Pose. What a joy to be together for 15 years in my Yoga for Seniors classes. 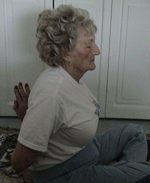 Yogini Doretta (septuagenerian, between the age of 70 and 80) demonstrates the Tortoise Pose, known as the yoga asana, Kurmasana. Notice the joy, the effortless playful ease of her posture as she posed for this photo. In 360 Yoga, all is calm and clear. Relaxation is the key, a portal to the Soul. Ah…here she is again! Pearl illustrates a yoga asana of the Eagle, Garudasana. Are you getting inspired? If you're into yoga, you know this posture is challenging. She holds it with grace and power, with an 'eagle eye' of awareness. Yogini Irene, one of my many nonagenerians (90s) sitting very focused in assisted Easy Pose yoga asana at the end of class. Her beautiful Soul tuning-in, connecting to Source. That's Yogi Bill behind her. They attended my daily 360 yoga asana classes for 15 years. Irene had the best laugh! When we occasionally played with 'laughter yoga' she would really get the whole class laughing hysterically. Here she is again (Irene) working diligently on her balance from abdominal strength in this yoga asana sometimes called, the Table Top.